Peacock Jaycees campaigns against breast cancer | JCI Puerto Princesa Peacock, Inc.
Incoming LOM president, JCI Mem. 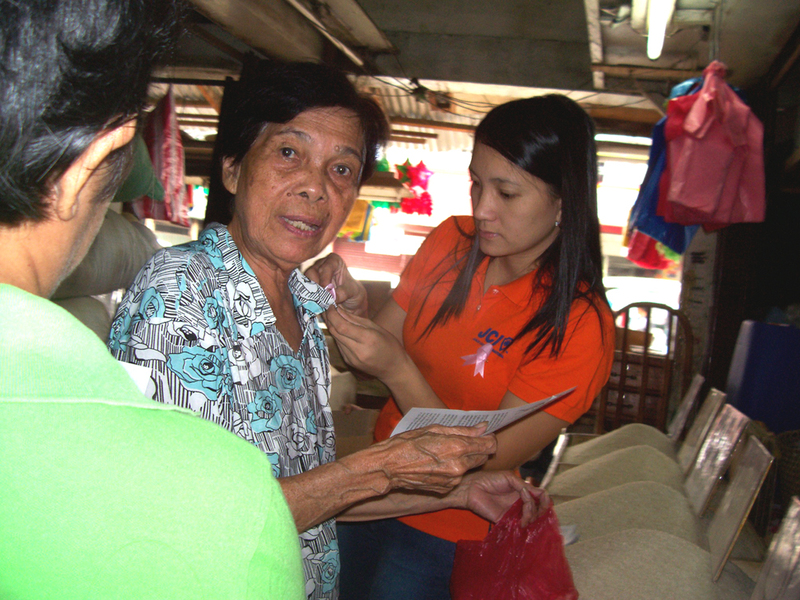 Gemma B. Medina, pins a pink ribbon to an elderly woman at the City Public Market during the implementation of DibdibangKilos: Kababaihan Laba sa Breast Cancer. THE all female organization JCI Puerto Princesa Peacock, Inc. (also known as Peacock Jaycees) implemented on Sunday, October 28, the project Dibdibang Kilos: Kababaihan Laban sa Breast Cancer (Women Against Breast Cancer) in the City through the distribution of brochures that contain information about early detection of the ailment and pink ribbons that symbolize support to the worldwide campaign to save many women. Now on its third year, outgoing and incoming presidents JCI members Emilyn R. Bayna and Gemma B. Batongbakal led the implementation of Dibdibang Kilos first at the Immaculate Conception Cathedral, to Valencia Street and public market, ending outside in front of the New City Commercial Center located at Lacao Street. Around 600 pink ribbons and 1,000 brochures were distributed by the LOM joined by more than a dozen of its regular members who were not busy during the weekend. “The implementation of this project is an opportunity for us women in the Peacock Jaycees to reach out and touch women’s lives in Puerto Princesa because many of them are not aware about how to detect breast cancer early. Early prevention, as they say, is always better than cure,” JCI Mem. Gemma said. Dibdibang Kilos is chaired by Baby JC May P. Pedrezuela, incoming regular member of the Peacock Jaycees, whose mother is a breast cancer survivor. “I feel honored to be chairing this project because my mother is a breast cancer survivor. We, women, should take care of our health. In breast cancer, early detection can save lives,” Baby JC May said. Dibdibang Kilos is a project introduced to the LOM by U.S. Peace Corps volunteer Kathryn Brashears whose mother is also a survivor. A parade around the City and a gathering at the Capitol Park Square was held in 2005 under the term of past president Celeste Anna R. Formoso to dream beat the start of a long term project. Every year, thousands of women around the world die because of breast cancer on a late stage. This means that their death were due to the late discovery of their ailment. Experts advised that if a lump is found on the breasts, examination should be done immediately.